DURHAM, N.C. -- Protesters in North Carolina have toppled a statue of a Confederate soldier during a rally against racism following violence in Charlottesville, Virginia over the weekend, CBS affiliate WNCN-TV in Raleigh reports. A female protester in Durham climbed the statue on a ladder around 7 p.m. Monday. 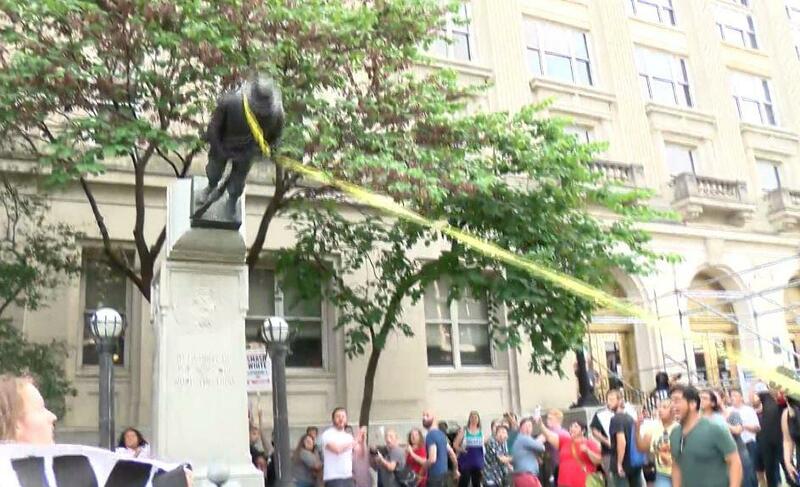 She attached a rope around the statue, and the crowd pulled it to the ground. The Confederate statue was dedicated to Durham back in 1942. Engraved on the front of the monument reads: "The Confederate States of America." One man quickly ran up to spit on the statue. Several others began kicking it. Protesters continued marching, while some posed with the broken statue. Durham police said they monitored the protests to make sure they were "safe" but did not interfere with the statue toppling because it happened on county property. "Because this incident occurred on county property, where county law enforcement officials were staffed, no arrests were made by DPD officers," Durham police spokesman Wil Glenn said in a statement. Protesters eventually blocked traffic while authorities tried to stay ahead of them. The protesters made their way down East Main Street to the site of the new Durham Police Department. North Carolina Gov. Roy Cooper responded to the incident on Monday night. "The racism and deadly violence in Charlottesville is unacceptable but there is a better way to remove these monuments," Cooper wrote on Twitter. "Today we got a small taste of justice," activist Jose Ramos told the station. Another, Loan Tran, said, "It needs to be removed." She added, "When I see a Confederate statue in downtown Durham, or really anywhere, it fills me with a lot of rage and frustration." Protester Takiyah Thompson said, "People can be mobilized, and people are angry, and when enough people are angry, we don't have to look to politicians to sit around in air conditions, and do nothing, when we can do things ourselves." In an email, Durham County spokeswoman Dawn Dudley said officials are prohibited from removing the memorials due to state law passed several years ago. "I share this to say that there is a statute in place making the efforts you mention below difficult to move forward. I would assume that the only thing possible are steps to reverse the law," Dudley said.